Dropping weight after pregnancy is a challenge for many women…so how do celebrities like Victoria Beckham step out slim and trim just mere weeks after birth? Lots of hard work. Victoria also says she followed a strenuous exercise routine developed by celebrity trainer Tracy Anderson. Anderson’s celebrity clientele also includes the likes of Cheryl Cole, Gwyneth Paltrow and Madonna. But New York Fashion Week was just a taste of what fans would see in the weeks to come; Victoria’s figure transformed even more in the coming weeks. The mother of four had to wait six weeks post-baby before she could start working out. She also suffered from a slipped disc just a few weeks after birth, which undoubtedly made working out a little more difficult. By September, the fashion designer was back to her ultra-slim self, ready to flaunt at the upcoming Big Apple fashion conference in November. Victoria also says that clothes make a big difference too. Her clothing designs help elongate her frame with the help of figure-hugging materials and flattering cuts. “I’ve never been a six-foot-tall, skinny model, so therefore I wanted to create an illusion. People think I’m taller than I am – not because of the shoes I wear but because of the way I dress. It’s all relatively streamlined. The slimming nature of her clothing line just might explain why Beyonce chose to step out last week, looking beautiful in a Beckham designed dress. Exercise, four kids, wife and fashion designer? That’s a lot on one woman’s plate…. 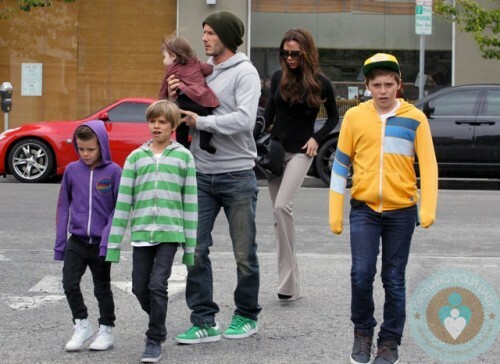 But it’s not that often that you see the entire Beckham family together. Quite understandable, really, when you consider their busy schedule. They did, however, manage to lunch together in Santa Monica last weekend. And Victoria reveals that, no matter how hectic their schedule gets, they all climb in bed together at the end of the day. “The cuddle up like little peas in a pod,” she said. And, amongst it all, Victoria still finds time to cook for her brood. Well, actually, it was her brood’s school; Romeo and Cruz are having an International Food Day at school and Victoria opted to share some British foods. She tweeted a picture of the spread last night. Featured in the shot were tasty treats like pork pies, sausage rolls and cheese and pineapple on sticks, all neatly arranged in three foil trays. 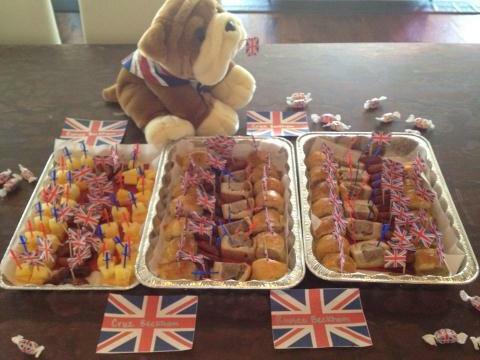 Each of the treats were adorned with Union Jack flags on cocktail sticks and an adorable little dog, wearing a Union Jack cape along with some candies wrapped in flag paper. NO doubt the post cesarean tummy tuck helps her out too.